When it comes to illuminating your home there seems to be an endless number of options available, but which one is the right one for you? By today’s standards, the answer would seem to be one of two choices (LEDs vs CFLs), however picking between two types of bulbs is only the tip of the iceberg. There are lots of things to consider when it comes to purchasing your next set of light bulbs, and to help you out we’ve come up with the following guide to shed a little light on the differences between LEDs and CFLs and to help you navigate the light bulb market place. Let’s say that you’re trying to replace a 60w incandescent light bulb for your home. When you go to the store you’ll find both LEDs and CFLs that can do just that: producing the same amount of light with a fraction of the energy consumed. So which should you choose? 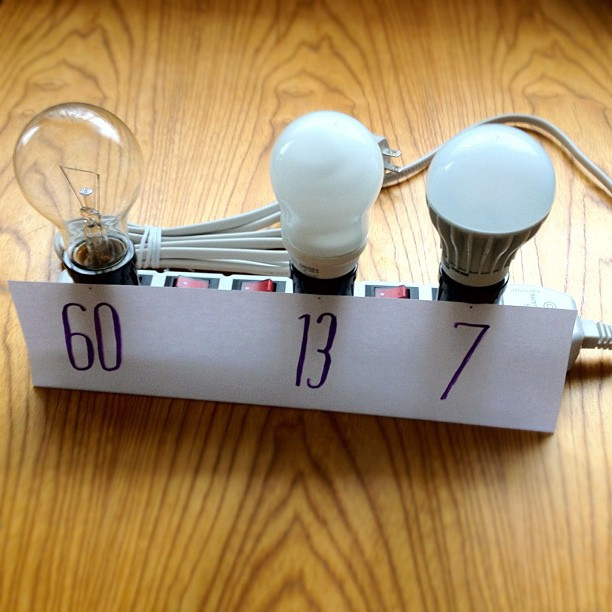 Well, if you compare the amount of energy used by each bulb type you’ll find that the LED bulbs will use roughly half as much energy as their CFL counterparts, meaning they’ll cost half as much to operate and will still produce the same amount of light as the 60w incandescent you’re trying to replace. However, LED bulbs tend to be a little bit more expensive when it comes to upfront cost. If you were to compare the three types of light bulbs (incandescent, CFL and LED) you’d find that LEDs will be the most expensive upfront per bulb. However this is likely the only time an LED will cost you more. This is because LEDs have a much longer life span than both Incandescents and CFLs. An incandescent will run for roughly 1,000 hrs vs a CFL which will run for 10,000 hrs vs an LED which will run for a whopping 25,000 hrs! In other words, in the lifespan of one LED bulb you’ll have to purchase roughly 25 Incandescents or 2.5 CFLs to get the same length of light output. Factor in that LEDs will cost you less to operate, and you’ll find that the longterm costs of LEDs are much lower when compared to both Incandescents and CFLs. There are dimmable and non-dimmable LEDs. This should be clearly marked on the product label. Dimmable LEDs, as a general rule, can be used in conjunction with just about any dimmer switch. The only exceptions we’ve seen are in cases where a house has very old wiring, wherein even a dimmable LED might flicker when dimmed. CFLs, on the other hand, are typically not suited for dimmer switches and would need to be dimmer specific in order for them to work with a dimmer switch. This is because a CFL uses energized mercury gas to generate the light, which makes them best suited for fixtures that don’t have dimmer switches. The gas takes some time to warm up, meaning that it’s dim when it first comes on and then as the gas molecules become more excited, they generate more light. The other thing to consider when it comes to using LEDs or CFLs is location (indoor or outdoor). While both bulb types will work in both indoor and outdoor fixtures, LEDs tend to be unaffected by moisture, making them a better fit for outdoor use. CFLs will also work in outdoor fixtures, but in conditions that are more humid the light bulb may take one or two minutes before it reaches full illumination. The exposure to moisture may also reduce the overall lifespan of the CFL bulb whereas the lifespan of LEDs seems to be unaffected by such conditions. Thus, we recommend, highly, that LED lights are used in places like bathroom vanities. The light comes on faster, and it will not be affected in the same way that CFLs will. Both LEDs and CFLs are a good choice when it comes to replacing your incandescent light bulbs. They’re both more energy efficient and will help to reduce your monthly electric bill as well as save some CO2 from being pumped into the atmosphere. LEDs will be a little bit more expensive upfront but cost you less in the long term, and CFLs are the reverse (costing less upfront but costing more in the long term). Both types of light bulbs will work in both indoor and outdoor fixtures but LEDs will perform better in cold/humid conditions.